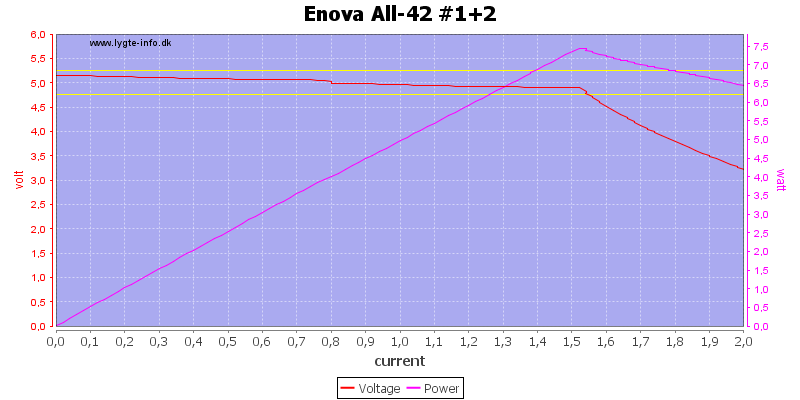 Enova has a long line of chargers with 2, 4 and 8 channels. 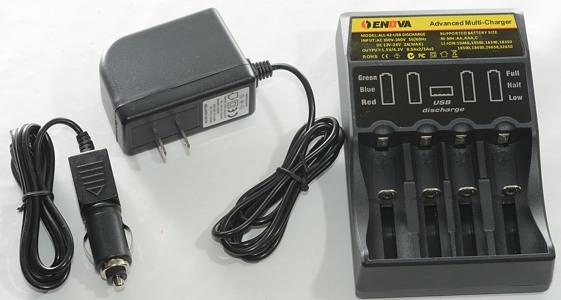 This review is about one of the 4 channel chargers. The charger can charge both LiIon and NiMH batteries, it has 3 leds with different color for each battery to show charge state. 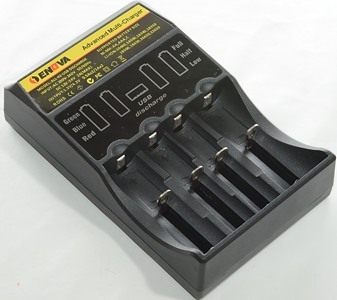 The charger has a 12 volt input, it can either be supplied from the 12 volt power supply or from a car. There is also a usb output, making it possible to use the charger as a power bank. The charger has a label on the front with specifications, but it is not correct. The charger does not have AC input. 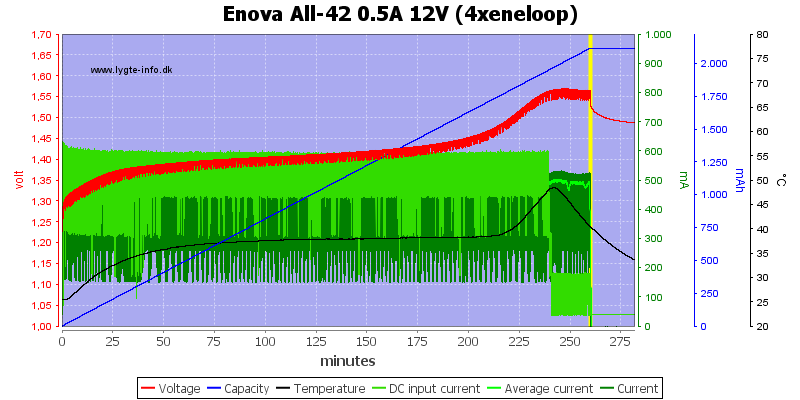 The output is not "x2", it is a 4 channel charger, i.e. output is "x4". 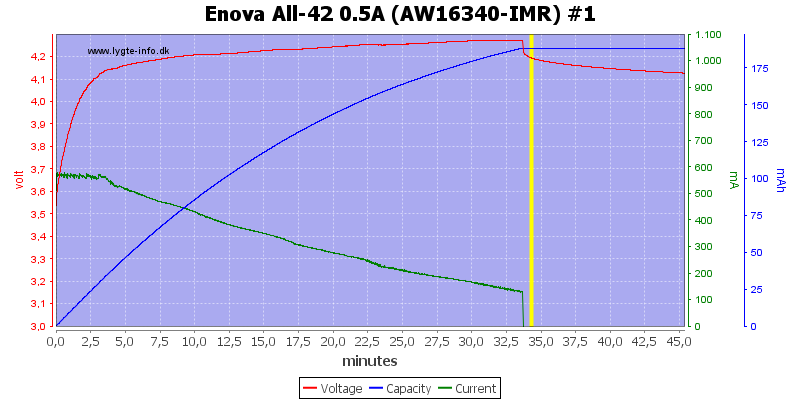 Charging a 10440 with 0.5A is not recommended (except for IMR types). There is 3 leds to show charge state. Red is empty, blue is partially filled and green is full. 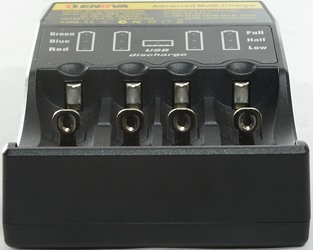 In the middle there is a blue led that turns on when a battery is in the charger, but no power is connected to the 12 volt input. I.e. 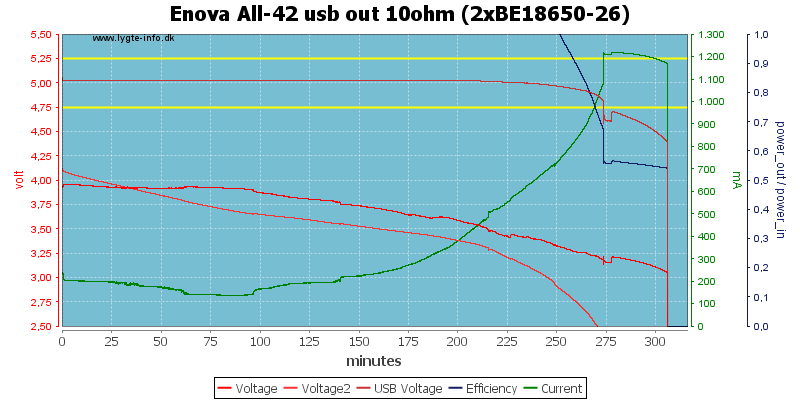 when usb output is active. 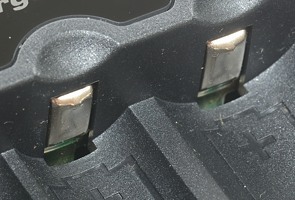 The battery slots are the usual construction and works acceptable, even though they do not have a metal rail. 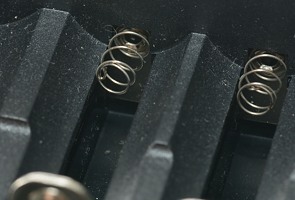 At the minus end of the slot is a spring, when the slider touches this spring the charger will charge with 1A current, when not, the charge current is 0.5A. It can handle batteries from 31mm to 70.5mm. The charger can handle 70.5 mm long batteries including flat top cells. With 26650 cells there is only space for two at a time. With C cells there is a problem with the small button top sliding off the plus pole on the charger. 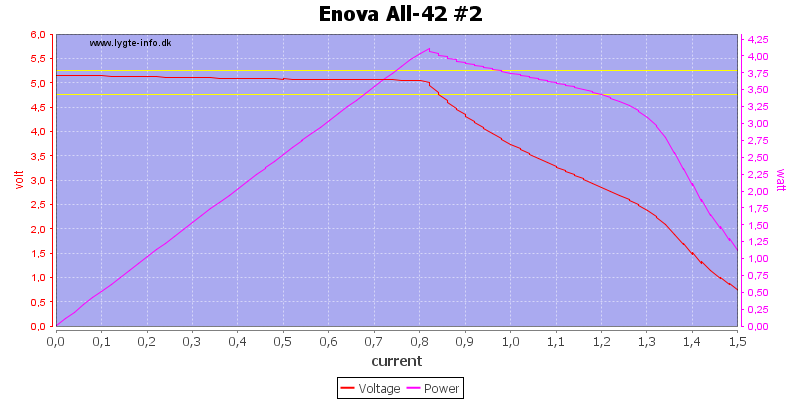 Above 2.3 volt charger assumes LiIon battery. 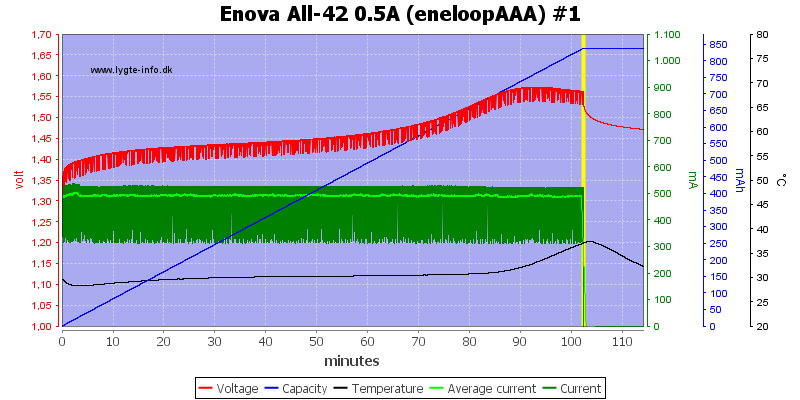 When not connected to power it will drain about 8mA from a LiIon battery, but only 0.1mA from a NiMH battery. 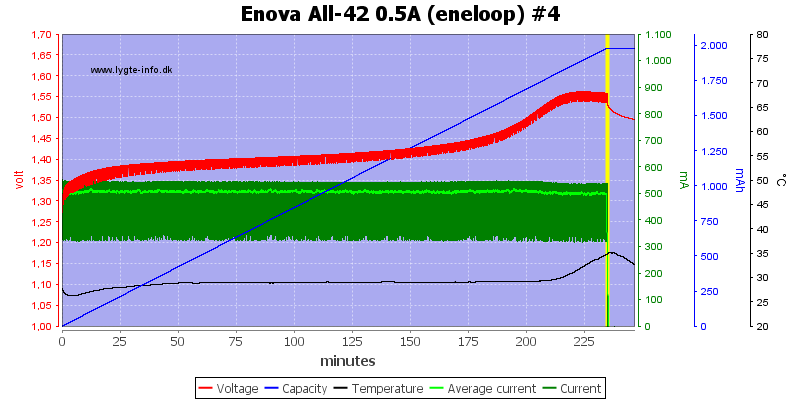 When charging is finished the charger will draw 0.7mA from the battery. 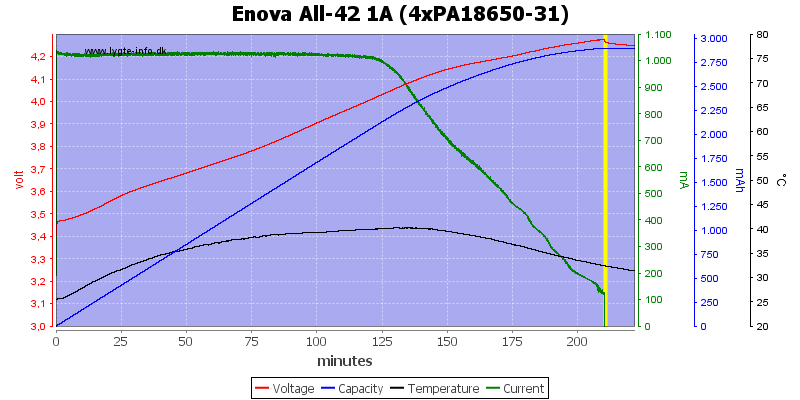 The charger uses a simulated CC/CV charge profile with a 150mA termination. The only problem is that the voltage is a bit to high. Charge voltage is supposed to be 4.20 volt with a absolute maximum of 4.25 volt on the worst copies of the charger, here we have 4.27 volt. The other 3 channels works the same way. 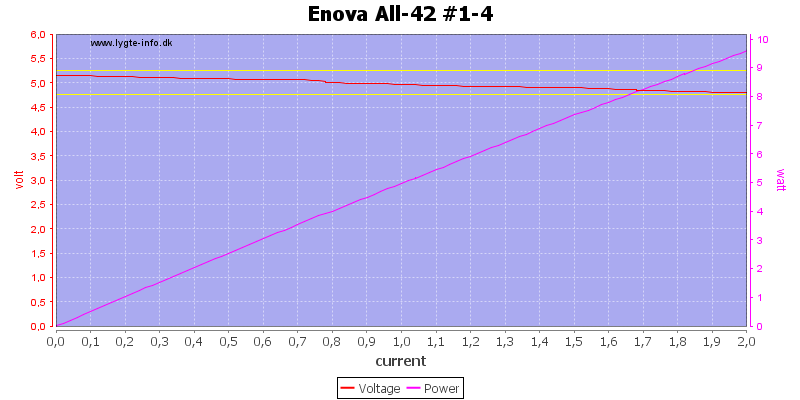 Channel #3 and #4 has even higher voltage (4.29 volt). The two other batteries does also charge fine, except the voltage again is to high. 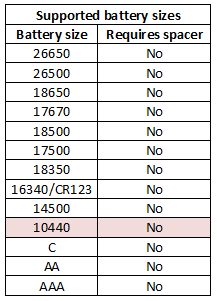 My old 16340 cell is handled without any problems. 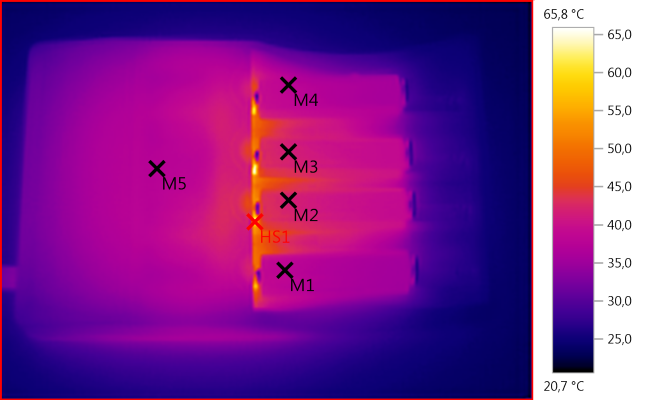 The charger will also use full charge speed with four batteries, but it do generate some heat. 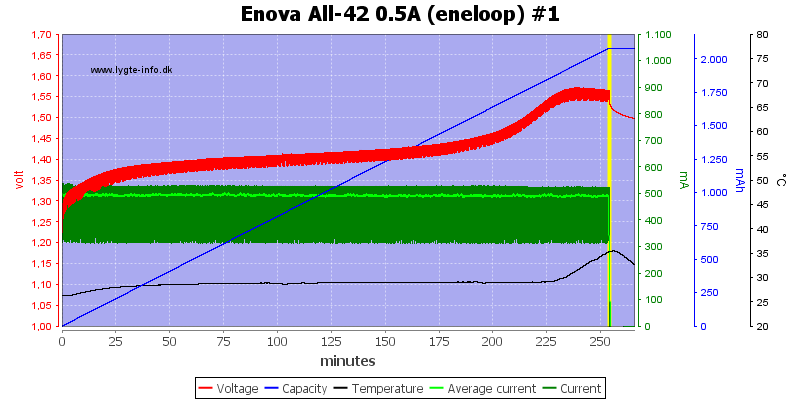 A nice -dv/dt charging of the eneloop cell. All channels works the same way. Using -dv/dt usual makes the charger slow to detect a full cell, the 7 minutes used here is fairly fast. No problem with four batteries. 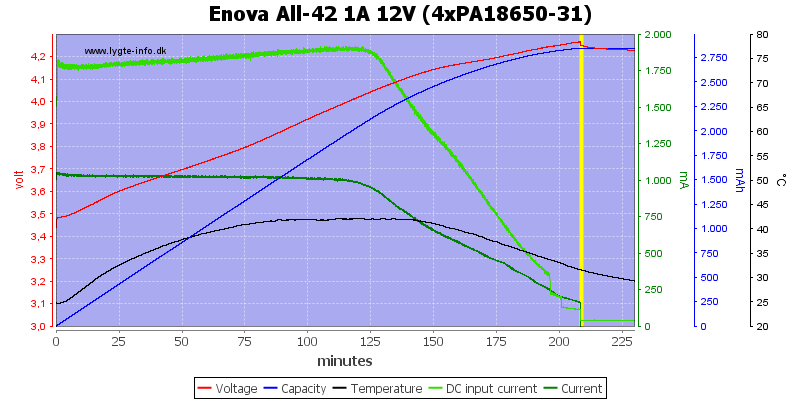 For charging NiMH it needs about 600mA from a 12V power supply. The charger can use any battery slot for usb output. The usb circuit will not turn off when the battery is empty, this can damage unprotected batteries. 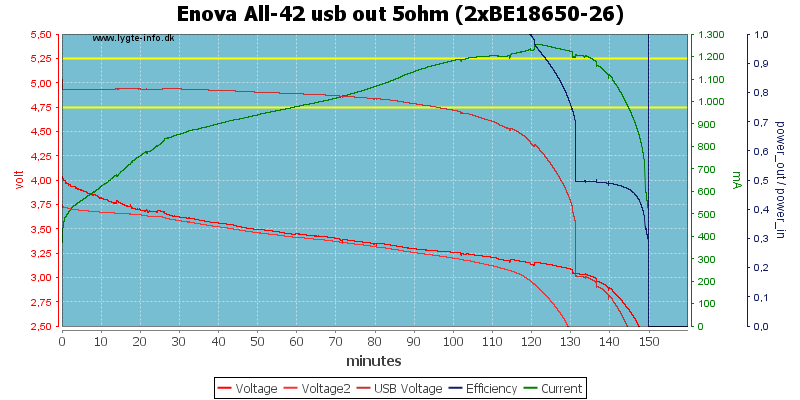 USB output is always on when charger is unpowered and is loaded with at least one battery. The blue USB discharge led is on when output is active. USB output is codes as usb charger (DCP). 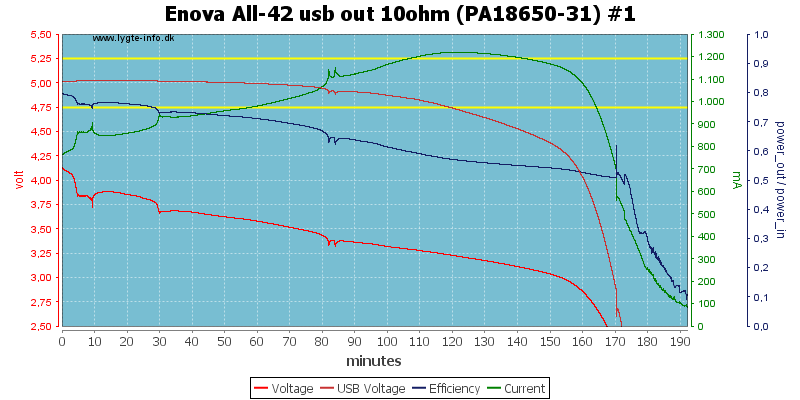 The usb output is rated for 0.7A and can deliver a bit above 0.8A with one battery, this looks fine. 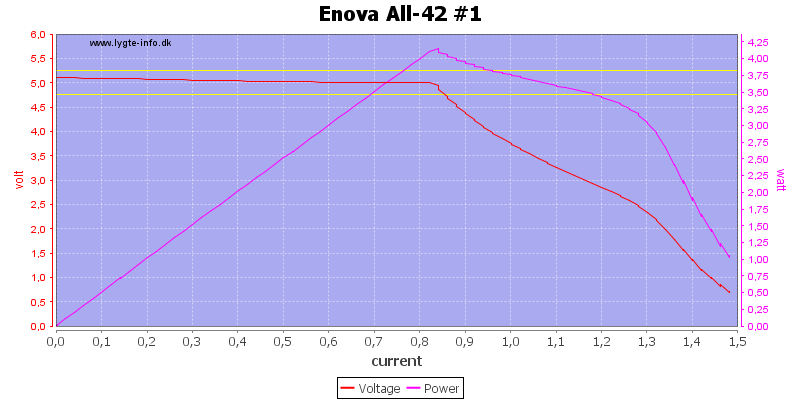 There is a minor difference in voltage and maximum current between the different channels. Using two batteries will double the current. The rating says 1A with two or batteries. 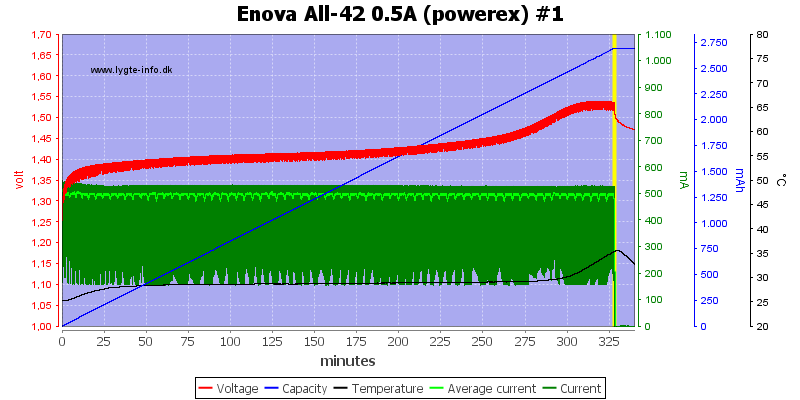 With all four batteries it can deliver considerable more power, but see below. First test is with a unprotected 18650 cell. 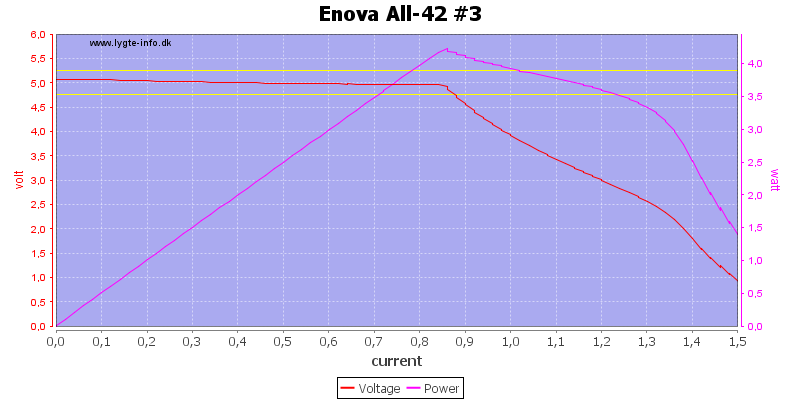 The output voltage drops below 4.75 volt before the battery is empty, but the output is not switched off when the battery is empty. I.e. this usb power bank function must only be used with protected batteries. Here I have used a protected battery. 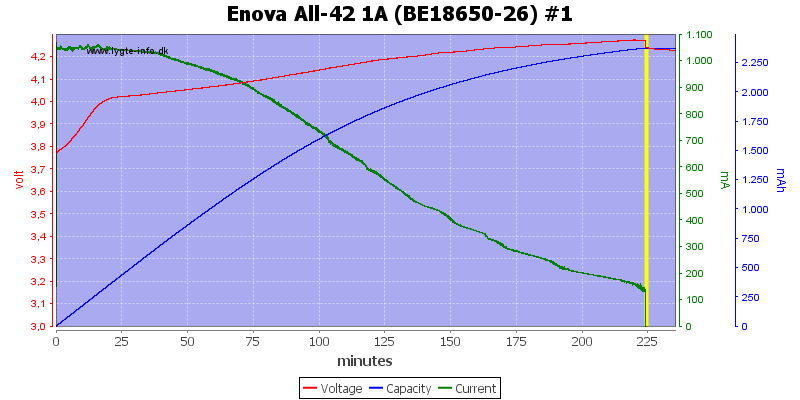 The efficiency is acceptable with a full battery, but drops very low when the battery voltage drops. WIth two batteries is can maintain the 5 volt, until one battery is empty. Note: The efficiency calculations are wrong, because I only measure current for one battery. With 1A load it has more problems. 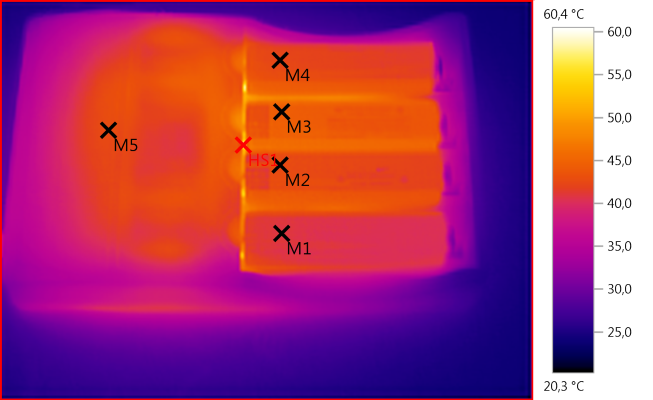 Higher load does not increase the noise, it is 6mV rms and 50mVpp. The charger has the correct charge algorithms both for LiIon and NiMH, but the voltage is too high for LiIon. USB output requires protected batteries and cannot deliver that much current, except when the charger is filled with batteries. 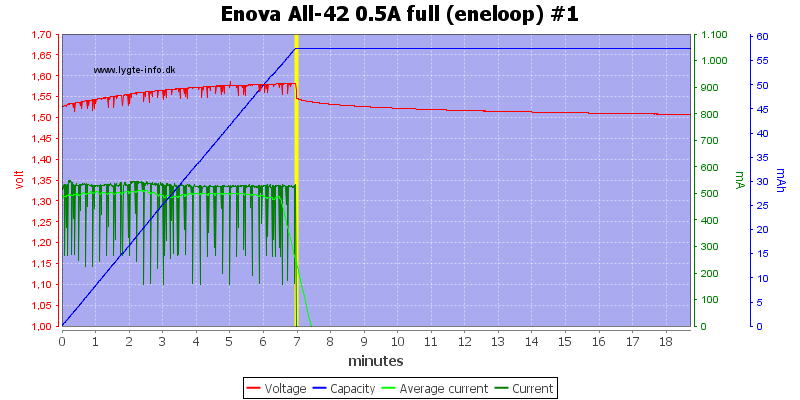 The always one usb output means that it is a bad idea to store batteries in the charger. 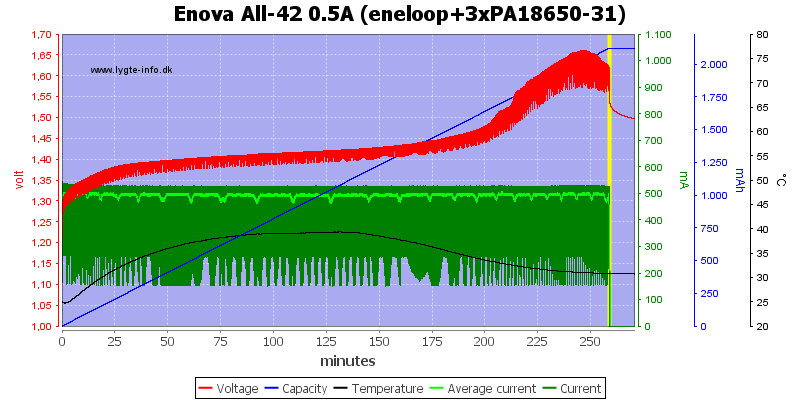 The charger is good for NiMH and will be good for LiIon if the high voltage is fixed.